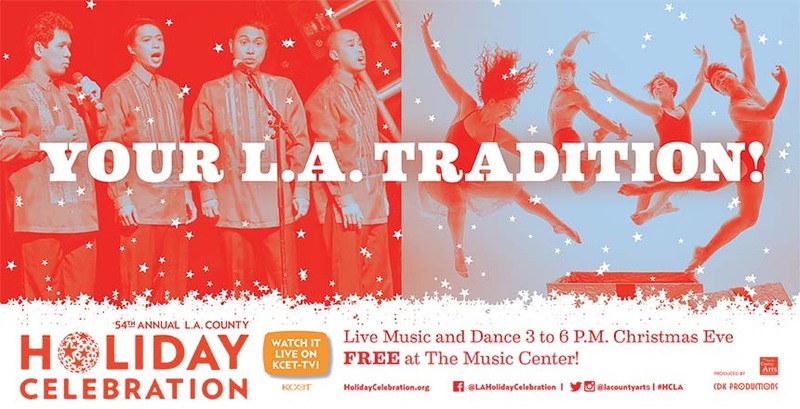 This annual event takes place at the Dorothy Chandler Pavilion at the Music Center, 135 N. Grand Avenue. The show runs from 3-6pm. If you want to see the whole thing from start to finish, make sure to arrive plenty early. Doors open at 2:30 but expect a line well before that. No tickets or reservations are required. People do tend to come and go so if you can’t get in right away, likely space will open up as others leave the event. • Aditya Prakash Ensemble - classical Indian music with jazz and Latin rhythms. • Artemusica- vocal ensemble performing holiday classics in the Baroque style. • Ate9 dANCEcOMPANY – performing modern dance created specifically for this eve. • Colburn Children's Choir and Young Men's Chorus of 50 voices singing in Hebrew and English. • Gypsy Allstars -music fusing Spanish rhythms with Eastern influences. • Harana Men's Chorus- seasonal repertoire in English and Tagalog. 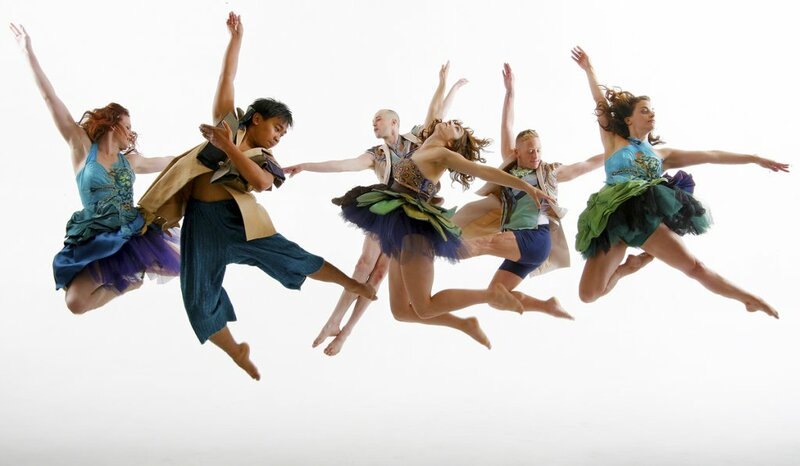 • Invertigo Dance Theatre- will perform a dance portraying a Jewish family in a time of celebration and reflection. • Mariachi Divas de Cindy Shea - female mariachi ensemble performing in English and Spanish. 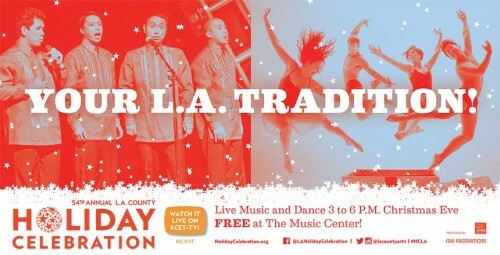 • Palmdale High School Choral Union- a 45-person chorus will present traditional and jazz-style holiday selections. • Praizum a 20-member vocal ensemble, will perform gospel hymns with a contemporary flavor. • Quetzal – East L.A. Chicano rock band performing songs celebrating the holidays. • Salvation Army Tabernacle Children's Chorus - light-hearted holiday songs. • Sarah Reich and Tap Music Project – tap dance performance set to live holiday music. • South Bay Children's Choir -80-voice ensemble, will sing traditional seasonal favorites. For those who can’t make it to the live event, the entire 3 hour program will be simulcast on KCET beginning at 3pm and it will play at 8pm that evening. You get another chance to see it on TV Christmas day at noon, 3pm and 9pm.